No matter what kind of industry you work in, budgeting the time you spend on social media can be difficult. As anyone who has a Facebook or Twitter will tell you, a brief "check-in" session can easily turn into hours. There are messages to answer, posts to write, profiles to tweak — the list goes on and on. Lately, it's become more popular for companies to schedule their social media posts in advance. This allows you to better budget your social media work. You can block off chunks of time to write and schedule posts, rather than having to check into the networks 24/7. Here are some of the factors you should consider if you're thinking about scheduling your social media activity. Perhaps the biggest benefit of scheduling your social media posts in advance is the amount of time it will save you. If you're a regular blogger, you know that batching — or writing a number of posts at once — is much more efficient than writing one each day. When you're batching, you're already in writing mode, so the ideas flow more quickly from your head to your keyboard. You can write 5 or 10 posts in one day and then not have to think about your blog for the next several days. You can sync your blog with social media and share the posts on your accounts at a specified time. Whether you're writing full-length blogs or just tweeting, you might also find it's hard to come up with ideas on the spot. It can take a lot of time and energy to come up with a few good tweets if you're not in a creative mood. However, if you write when your mental juices are already flowing, you'll get a lot more done much more quickly. It's true that you can still batch-write posts without scheduling them, but adding articles to a queue after writing them will make you much less prone to distractions. When do you log on to social media and just post something? If you're like everyone else, you probably read comments, respond to messages and do other things you don't necessarily have to do right at that moment. Scheduling posts also lets your readers know when they should expect new content from you. Say you choose to post at noon, 3 p.m., and 7 p.m. Readers will grow accommodated to this schedule and will visit your blog or profile at these times. It helps keep your readers active and interested. You can keep a schedule without putting posts in queue, but this can be very time consuming. Scheduling posts is especially important if you know your target audience will be checking social media at specific times you won't be available to post. For example, if you're writing a CE post, your readership will consist of working adults looking to go back to school. They'll probably be checking social media after work at 5, but this may be when you're starting your commute. Scheduling the post to publish then ensures they'll actually read it. One of the biggest challenges of scheduling social media posts is that you don't want your posts to sound like they were written in advance. This can make you sound like a computer and not an actual person, especially if you post something out of sync with current events. For example, if you post something really chipper minutes after a national disaster breaks, you're going to look pretty insensitive. Readers will suspect your post was pre-scheduled and feel like you're inauthentic or worse, think you don't care about what's going on in the world. Some worry that scheduling posts in advance is the opposite of what social media is all about. One of the purposes of social media is to engage each other and react to events as they actually happen. This can make pre-scheduling posts sound like it's taking the social, engaging element out of social media. Social media is also increasingly being used as a news source. Twitter and Instagram are often the first sites to report breaking news, because anyone can post about an event right as it happens. In light of this, posts might be outdated if they're scheduled too far in advance. Also, you can seem out of touch if your posts do not comment on current events. To split the difference, some businesses find it helpful to schedule the majority of their posts, but allow room for spontaneity. You might make a point to have one current tweet every few days and post something right away if it's particularly timely or relevant in your industry. If you do decide to schedule posts, make sure it doesn't limit your activity to too much of an extent. 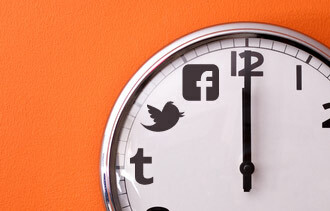 Do you schedule social media posts for your business? Why or why not?